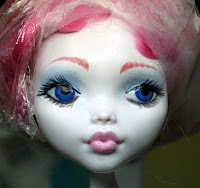 Ginger, one of my Custom Monster High dolls. I receive many questions every week about customizing Monster High dolls, as well as dolls such as Barbie and other fashion dolls. I answer these questions because I know how difficult it can be to find the information one is looking for when a person is just starting out on a new adventure such as doll customization. When you look at Ginger in the above photo you see all of my talents and knowledge of customizing basic dolls rolled into one. She had her original hair removed, her original paint removed and she has been made over complete with eyelashes. Most of the questions I receive about customizing dolls have already been answered in one of my doll custom tutorials here. After the last set of questions I thought maybe it was time for a post that included some new things and also links to the other posts you can use to help you find your way through the process of customizing your own dolls. I use Liquitex tube paints. There are other brands, but whatever the name-- I recommend you use artist grade paints. The reason for this is the quality of the paint. Use quality paints. It does make a difference. If you are going to spend your precious time customizing a doll, it only makes sense to use the best tools and materials to do so. Same as with the paint- buy quality brushes. And- Take Care of Them. Rinse them out often while painting and change your rinse water often as well. Dirty rinse water can make your paint job look bad as it can dirty up the color you are using. Make sure to clean your brushes with soap and water thoroughly when you are done using them. If you wind up with dried acrylic paint in your brush soak it in 100% rubbing alcohol and then clean it. You can often salvage a brush using this technique. I use the more expensive soft chalk pastels for blushing when I am customizing. This is because there is more pigment and a finer ground in the more expensive ones. These are called 'soft pastels'. Do not use oil pastels- some people confuse these, and oil pastels will not work. 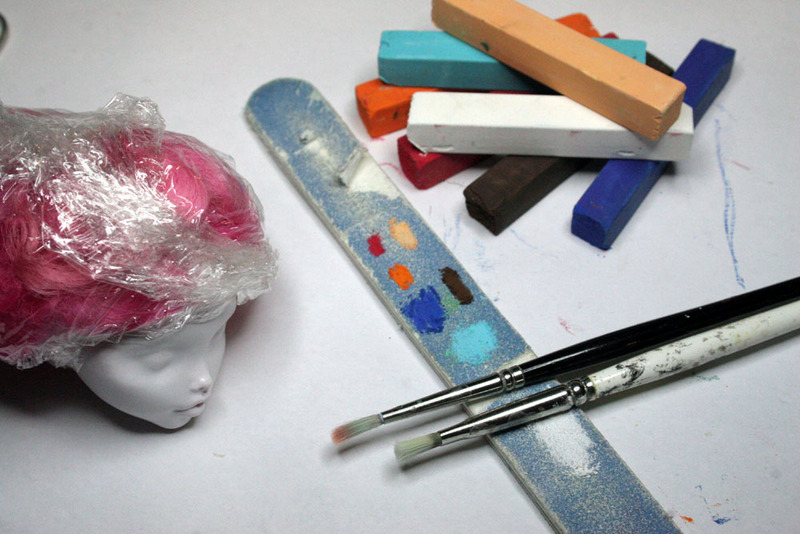 Use one brush for pastel blushing your dolls- and do not use it for anything else. The brush needs to remain soft and clean. Whenever I am unsure of a color, a technique or need to practice a paint stroke I am going to use I go to my practice doll. You can find dolls at thrift stores and even the dollar stores that you can purchase and then use to practice on. 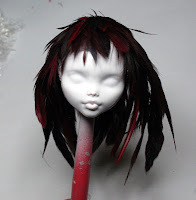 If you have spent 25.00 on a Monster High doll, you intend to make into a custom doll, you do not want to experiment on that doll. You can mess up a practice doll over and over and not have the emotional and financial heartbreak of messing up an expensive doll. I use Mr Super Clear Flat and Testors Lusterluss Flat Clear spray paints over my paint. This not only protects the paint, it also gives a soft look to the skin of the doll. It removes the shine. Both of these are in fact lacquers. Sometimes I have trouble finding Mr Super Clear. Testors works just as well in my opinion and if you need to pinch pennies, buy the Testors at your local hobby or model train stores. It costs less than Mr Super Clear. When you are sealing lips or eyes on your doll and you want them to look wet you need to use a 'clear gloss' over the paint. I have used 2 different products for this. Liquitex clear gloss and Sakura Crystal. Liquitex works just fine - in both cases you need to let it cure completely. So no touching dear dolly for at least 2 days. I use a clear plastic shoe box without the lid snapped shut- the lid just sits there-- to keep the dust off --but it still allows the air to move. I put her or him where I cannot see them -- because after you have finished a custom doll, you want to touch them! I use fake eyelashes that you can buy at the drug store. After experimenting a lot, I found that I prefer the ones that come in tiny separate clumps. You can find these on eBay for a lot less money- but- unless you plan on doing a lot of dolls, buying them at a store makes more sense. I use my tweezers to hold each small clump while I use my fingertips to remove the sticky glue that is there. It needs to come off before I use my own glue to put them in place. Often I use the same clear gloss sealer to adhere the eyelashes. I put some down, let it start to dry a bit, then set the eyelash. Depending on placement, I will hold it with tweezers until it stays put. I have also used Beacon Fabri-Tac glue- but it is tricky and not very forgiving to use in this case. If you are accomplished with using this glue, this may be the answer for you. I use a toothpick for application of the glue- and hold the eyelash with tweezers. There are more tutorials in the works. I'm curious; how do you keep your paints from being scraped off by the movement of the joints? I've had that problem with pretty much every paint method I've tried so far. There is no way to keep paint from being scraped off in the joints -- sealing helps some, but the action of the scraping will remove paint- on any surface. Thanks for linking this post to all the tutorials. And thanks for sharing your tips. Next custom u make, can u make a tutorial on how to make ur perfect eyes?